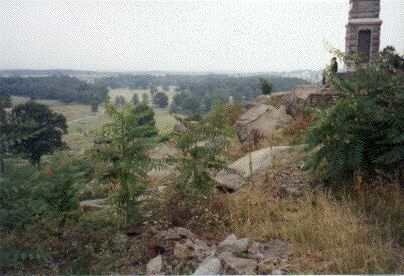 This photograph, taken after the battle, shows the Union fortifications on the summit of Little Round Top. Near here, Lt. Charles Hazlett and Brig. Gen. Stephen Weed were shot by a Confederate sharpshooter in the Devil's Den. Below is a photograph of the summit taken in August 1999.